To have no trade deal or Brexit transition arrangements in place well before March 2019 would be hugely negative for both the British and EU economies, according to Danske Bank’s head of agribusiness Robert McCullough. Mr McCullough spoke at this year’s Farming Life and Danske Bank Awards. Commenting on the specifics of the farm policy options that might come out of London in the run-up to Brexit, he said that he was more encouraged by some of the language being used by the Prime Minister and Michael Gove. Recent weeks have seen the DEFRA Secretary of State (Gove) confirm that Northern Ireland will receive the same proportion of the UK’s agricultural support budget, post-Brexit, as is currently the case. There had been fears that the Barnett Formula might have been used to distribute the UK government’s expenditure commitments to agriculture in the devolved regions, once Whitehall became the driver of farm policy. Such a scenario would have seen Northern Ireland losing out significantly, relative to Scotland and Wales. Mr Gove also wants to see regional flexibility, when it comes to the implementation of future farm support measures. Mr McCullough believes that the current political deadlock doesn’t reflect the maturity of Northern Ireland society as whole, and particularly where young people are concerned. “This has the potential to be very damaging going forward,” he said. “Most of the people involved in our farming and food industries will have enjoyed and benefited from a devolved government and a dedicated minister over a number of years. The Danske Bank representative confirmed that, in general terms, the farming industry is in a good place. “Yes we have weather challenges but then we always find a way,” he continued. 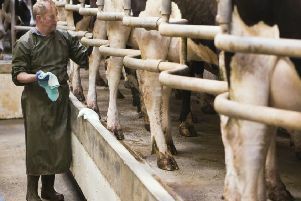 “The dairy industry which is the engine room of agriculture in Northern Ireland is enjoying a much better trading environment as are the other sectors in general and this has a direct impact on rural communities. He continued: “Agriculture is the heartbeat of rural Ulster. The industry is recognised across the world for the quality and integrity of its produce and the innovation of its people.